The October release has been full of some gorgeous new products and we hope the projects from the team have been beyond inspiring! I've picked out favorites of my own, from each of the design team members, to share with you today! Click the link next to each team member's name to see more details about the project shown here, as well as the rest of her projects from this release! And be sure to read all the way to the bottom of the post…..you won't want to miss out on this month's release in review CONTEST!!! 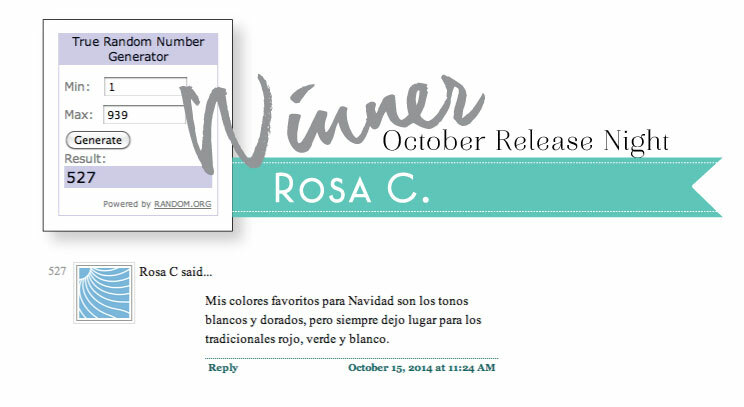 Congratulations to Rosa C! Please send an email off to customer service and provide them with the email address you would like your gift certificate to! And thank you to everyone for stopping by tonight! Happy shopping! Last but not least, here are the color combos and sketches collected from some of your favorite release projects from this month! You can pin the individual graphics or download the four page pdf below. My absolute favorite Christmas color combination is the light teal blue, red, white and silver. 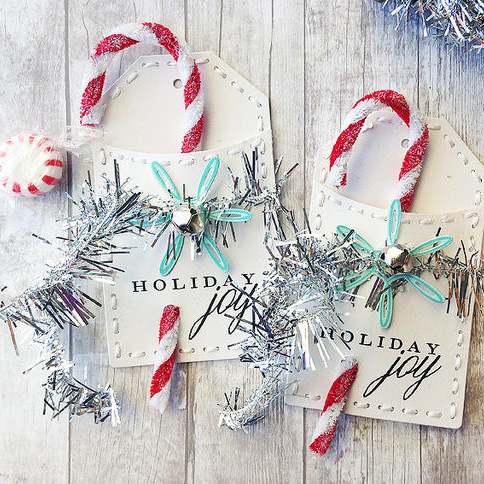 Love the candy cane tags! My favorite holiday color combo is the orange, black, and purple of Halloween. It has to have the purple, though, not just the orange and black! My favourite colour combination for Christmas would be red and silver! Can’t wait for release! I love the traditional colors. Red, green, white, gold. Thats christmas for me. I always use red, green, silver. And little touches of black white and gold. I still love these colors all together. That’s Christmas for me. Red, white and kraft, or pastel pink and aqua with gold. I would have to say Im very traditional for christmas. Red, green,and gold. I love the modern twist of pink, aqua and kraft with the red/green variations… Its more homey and country than too ‘Christmasy’! I love shades of blue, white and silver for Christmas! I love purple,white and gray!!! I made a Christmas card with those colors, my goodness, it was so pretty!! I’ve always loved the winter tones of blues and silver for Christmas but last year I discovered how amazing red, gold, and a dark grey like smokey shadow are together. My favorite is blue and white and a little dash of silver. Oh, I really love different colors each year. I tend to like unexpected combos though. I love dark teal olive green and white or silver. The first color recipe looks fun to try! My favorite Holiday color combination is red, green, and gold. I love the traditional colors. My favorite holiday by far is the Christmas holiday season and everything leading up to December 25th. I love all of the colors of Christmas, but there’s something about red, green and silver that just seems to do it for me. Really enjoyed the release preview! I love poppy red and chartreuse green. So bright and fun!! What a fantastic release. My favorite holiday color combo is the traditional red and green. I’ve replaced the traditional Christmas red with a pink, making pink and green a cute twist for the season. A close second favourite is aqua as silver as its a really classy look. My favorite Christmas color combination is gold and cream, although I’ve seen seem things created with soft blues, greens and whites that have caught my eye. I love the jewel toned, but traditional colors. I also like a hint of metallic on some things. I use different color combinations for Christmas from year to year. I like to switch things up and try unexpected combos too. My favorite colors for Christmas are I red and chartreuse green. That’s what I use on my tree and it turns out beautifully. My favorite holiday color combo is Pure poppy, white and spring rain or Hawaiian shores. I especially love red and white at Christmas. I am very traditional when it comes to Christmas- red and green with some silver. My favorite colors for Christmas are white and silver, so elegant! My favorite holiday color combination is the traditional red, green & white with a hint of gold or silver. I like the traditional red with light and dark green, but I also like pinks with blues and greens. And I love adding gold and silver to all of my holiday cards! I tend to go with traditional colors with a graphic twist. I love red and green paired with black and white. For Christmas colours I love red, spring moss, aqua & gold. Always add in the gold touches. For me, it’s tradition Christmas without being too wintery, given that our Christmas’s are always about the summer & the beach. Pink and teal are my new favorite. I love red and green but I also love seeing new things with non-traditional colors like blue and silver! I would say my favorite is the traditional red and green at Christmas but I do also really like some of the jewel tones. I like kraft, red and white! But then I also like the traditional red and green…oh and I love blues and pinks…gosh hard to pick a very favorite. But this year I am going with the kraft, red and white for gift wrapping! I am traditional for the most part with red green and gold. But lately am starting to shift to light blue cream and silver. I like to use kraft, red and aqua but I also like to use traditional sometimes too. It depends on the cards I’m making. My favorite Christmas tree in our home is the one with multicolored lights and all different kinds of ornaments. I searched for a pre-lit tree with multi-colored lights about 6 years ago and it took me forever!! It was my son’s request. He still enjoys unwrapping the ornaments and decoration the tree!! I tend to stick to variations of the traditional red and green but aqua and silver are a close second!! Gold and red for me. I’m going to say blues, purple, & white with a touch of silver for a favorite. But that’s a really tough one! Burgundy & olive or rich, bright cranberry with bold green are favorites of mine in a more traditional red/green combo. I still gravitate to the traditional red & green. However, if I were going to switch I would choose pink & aqua. Thanks. Aqua and Red have become my favorite holiday color combo.. love the release, and I’ve already made my list, and checked it thrice! I’m a traditional kind of gal…red, green and some metallic thrown in for some sparkle or shine! I am such a traditionalist! Can’t help it–gotta have red, green, and gold. Deep red and pine green. With some silver. Or blue and cream. So many beautiful combinations, it’s hard to choose one. I love red and green, but I am also partial to silver and light blue tones. I like cranberry and olive as well, which I guess is a form of red and green. Light blue or aqua/white/silver metallic….my favorite combo. I like RED and KRAFT together. I love white on white, because it reminds me of snow. I love snow! I’m boring and traditional. I love a red red and a green green for Christmas. My favorite holiday color combo lately is red, white, turquoise, aqua mist, silver, and green. It’s what we’ve used the last few years to decorate. When you’re talking about Christmas , my favorite colors are the traditional red and green with gold. You can’t go wrong! My favorite color combo for Christmas is lime green and red !!! It’s so bright and cherry without gearing away from traditional Christmas colors. I like a forest green and cranberry red. Love this release! What a difficult question… Love the traditional red & green, w/ a little gold. But I’m drawn to the lovely aquas & red/pink, w/ a little silver. Too hard to pick just one combo! I really love the purple/green/blue/silver combo that pops up around this time of year. So beautiful! This year I´ll change my whole decorations from the tradional red and white to silver and autumn rose. My favorite color combo for Christmas is still the trusty, traditional red, green and cream or white. Although I’m enjoying seeing some new Christmas color combos like aqua and pink, I guess I’m a traditional girl and still gravitate toward good old red and green with plenty of gold accents. Aqua Mist, Pure Poppy and White! My favorite holiday color combination is dark red and hunter green for Christmas. Some gold and silver accents go very nicely with it as well. I love Scarlet Jewel & Pinefeather with a little bit of gold. I like silver with blue, or pink, or red. My favorite holiday color combos are pure poppy and blues, paired with silver or gold. It’s always fun to incorporate non-traditional colors too, for lots of variety. Variations of the traditional red & green over the years have been my standard. Some years it was Scarlet Jewell and Aqua Mist, others Pure Poppy and New Leaf, or Pinefeather. Sage green and silver were my colors of choice the past couple of years, with a smattering of a sparkling white with a hint of Autumn Rose. Any or all of this woven into a bold plaid, will always work for me as well. I love the dark olive and cranberry colors. This year I am leaning toward the aqua, gray and red. I’m a bit of traditionalist so red and green work for me be it bright and merry or more of the vintage tones. I’m also a big fan of some of the color combos that have come out the past few years with the browns, blues, whites and pinky reds. Wonderful release! I like silver a lot so I try to decorate my house with it for the holidays. The accent color varies. Last year it was teal, I have also done bright pink. This year I might do a combine of silver and gold. Classic cranberry red and hunter green. I love blue and white–especially on kraft card stock. I love navy and white or cream but I tend to mostly use the traditional red and green. I am just loving the snowy blues and teals with white and a pop of red! I have a few favourite combos. One is dark red and an olive green with kraft. Another is light blue and light grey and silver. Naturals with touch of gold or pearl and a little green or brown are nice too. My favorite Christmas color combination is aqua and red. I Love the traditional colors red, green, gold & silver !! Fantastic Release !!! I really like traditional red and green, but my fav is blue and silver! Elegant and modern! I like traditional red and green for my holiday decorating but blue and silver for cards. I love so many, but I’m always drawn to a simple red and white, with maybe a little black or sparkle thrown in. I always go to Kraft and Red. It seems to remind me of home. Add some white heat embossing to the mix and I am all over it!! I always make a cool blue Christmas card with silver accents. I love the rustic look of Kraft, Poppy, and White. I also love the retro look of Aqua Mist, White, and Poppy. Traditional colors are my favorites, but I like a little extra thrown in so pure poppy, new leaf and aqua mist are a wonderful combination in my eyes! Too many combos to choose from, over the years, I think I’ve tried so many! But if I had to pick, it would be red/white. Just the simplicity of a folksy set of colors brings the heart of Christmas home! Outstanding release this month! I would have to say kraft, cream, and red! A classic, homemade kind of color scheme! My favorite Christmas color would be red and white,though I tend for wrap everything in gold or red. Love blue and white it seems so magical! My favorite color combo is aqua (Hawaiian Shores) and Dark gray. Thank you so much for a wonderful release count down! My favorite color combination is a twist on traditional with pinks and greens with some metallic mixed in! I must admit I am a traditionalist with Christmas so deep reds, golds and greens are my fav. If I had to pick second I go the other way and say peacock blue, vivid green and silver. For fun Christmas colors I adore aqua and red. Really I love that color combo for about anytime! Dark blue and silver are a favorite for Christmas star themed cards and Burgundy and gold for elegant cards. I made a card using Polka Dot Parade tree with Simply Chartreuse, Raspberry Fizz, Hibiscus Burst and Aqua Mist and it turned out to be my favorite card so far. I found another Christmas card I made using the same colors, so that must be my favorite! I love pink and aqua together. Or aqua and red. New Leaf, Pure Poppy and Kraft will be my color choice this year! Love the pinks and the teals!!! My favorite holiday is Christmas and I am very traditional so my favorite holiday color combo would red and green with silver and gold accents. For Christmas I do love the reds and greens with some gold added somewhere. Red and white, with a touch of silver or gold, is my favorite holiday color combo, although there are many others I love! I’ve never met a holiday color scheme I didn’t like; but, my favorite is icy aqua, red, white and silver. I love the traditional colors of Christmas; red, green, silver and gold but I’m also warming up to the newer look of teal, pink and white! This year I am loving Aqua and red together. I love the traditional green and red but I have been known to have light blue and peach on my Christmas Tree! My favorite holiday color combination is pink, silver, and white with a little touch of aqua. Great release. I love kraft, red, and white with a touch of silver for the holiday season. Fabulous release!!! Thanks for the chance to win! I’m a traditionalist, so I love a good red and green tartan plaid during the holidays! My all-time favorite Christmas color combination is aqua/teal and true red. I just love the contemporary look the aqua/teal gives to all of the projects I do for the holiday season! To me Christmas is always about Red & Green, but I like to add some other options in such as gold or silver. Thanks! Kraft, red and white. I love the rustic of the Kraft with the crisp white and that pop of red. Thanks for the chance to win. Can’t miss with traditional colors, then add silver and gold! Easy answer! Aqua Mist and Scarlet Jewel with a pop of Pinefeather. Love Love Love that combo. Thanks for the opportunity. I can’t wait to order some of these stamps and dies. I love the songbirds collection. 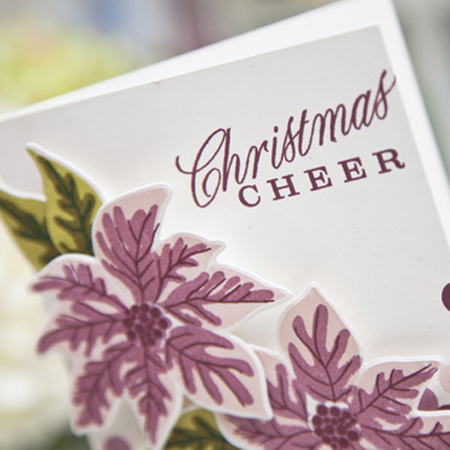 Reds, greens and golds – absolute favourite Christmas card colour combination. The release review: gorgeous! Thank you for creating products and projects that bring joy! My favorite color combo for holiday is either gold &white or silver &whiteSome times I’ll add an embellishment with color. My all time favourite Christmas colors are silver,pale grey, and light aqua, with a touch of soft green. Just love them! My favorite, if I have to choose just one, is light blue and silver. I like blue, silver and white especially with some metallic glitter! I like to use pale pink and silver. I have always been drawn to the blues and silvers combo. It think they are so calm and peaceful for Christmas. A lot of white/cream and gold for decoration. 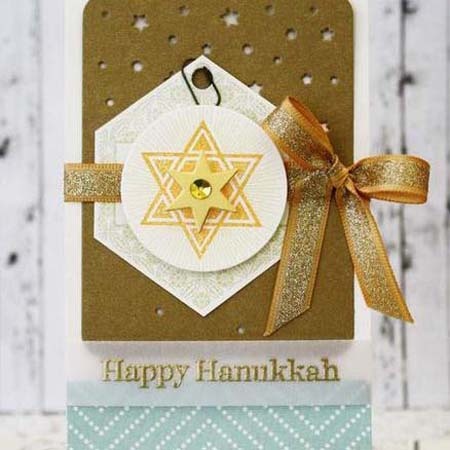 For card making anything from traditional to nontraditional! For Christmas Cards I usually stick with traditional Red and Green. I love blues and purples for winter though. My living room is Fall colors (lots of rust) so red has never worked for me. I go with blue and gold for the holidays. The gold goes well with all of my browns and blue is a perfect accent color. My favorite holiday color combination is white, pink and light blue/aqua mist sometimes with touches of gold. BTW I LOVE all the stamp-a-faire sets. I have kept using them since saf 2014. (I also started using my Paper Crimper a lot more since then lol). My favorite color combos are the more traditional colors red,green,white and gold! I don’t have a favorite I have several, both traditional & non-traditional, but I like pretty much all of them to have a little sparkle of some sort with them. I love the blue and silver. There is just something so pretty about this color combination. Traditional for me with a modern flare…pure poppy and “Grinch Green” as I like to say…I guess that translates to simply chartreuse! Xmas for me is either scandinavian like ( red and white) or totally girly ( aqua mist+ simply chartreuse + autumn rose and a little silver glitter on top ! ).I lOOOOve the bird die ! My favorite Christmas color combo is blue and silver with a little white. my favorite holiday color combination is the harvest fold, pure poppy, simply chartreuse and new leaf. These colors reminds me of the tastes, smells and feel of the holidays. I lean to the traditional colors of deep red and green with gold as an accent. I definitely am a traditionalist and love the basic colors of Christmas – green, red and metallic. Your Inspiration Recipe Cards just might have me thinking out of the box, though! Navy blue and silver is my favorite Christmas color combo. I would have to say red and green. All different tones of red and green, but still red and green. Blue and a glittery white or silver are my favorite Christmas colors. My favorite holiday color combo is light blue, white and silver! Makes anything you create so wintery and beautiful. 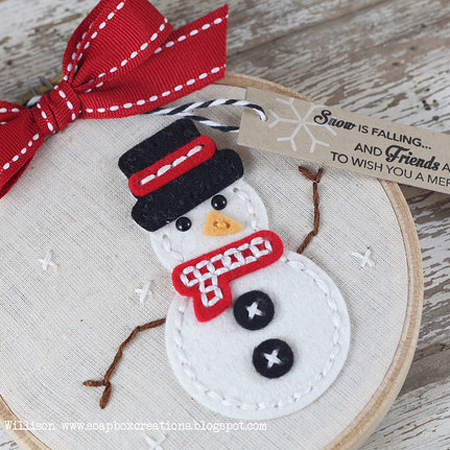 I love everything craft for the holidays, combined with brown, cream and red or green, or both… I love the homespun feel of craft! While I love the traditional red and green, I sometimes like to mix it up with a little pink and lime green. I also love to add silver or gold to the red and green combo. I LOVE Christmas and can’t wait to start decorating! Don’t worry, though, I don’t do anything until December 1. My favorite is red, green, black, and white. For Christmas cards I am fairly traditional with bright red, white and bright green but I like to mix in kraft also. Sometimes I will also replace the white with another neutral like soft stone or rustic white depending on the style of the card. I guess if I had to pick a favorite, it would be the traditional red and green. ( A burgundy red.) I am also partial to silver and white! It can be so magical! I love using kraft with red and white for Christmas cards. Call me old fashioned, but I like red, green, silver and gold. For Christmas colors I love pure poppy, ripe avocado, kraft and a hint of ocean tides. No traditionals for me! I love to change it up each year- the unexpected is more surprising! I love something interesting and non-traditional. Favorite color theme is light blue + grey! For Christmas I’m traditional with a country twist. I’m drawn towards you cranberry red, forest green and rusty brown. But I enjoy all things Christmas – with a name like mine I couldn’t help it! My favorite is the antique reds and greens with gold, however the traditional red and green are beautiful too! My favorite colors for Christmas are aqua/teal, red, white and silver. My favorite Christmas holiday colors are blue and silver or cream. My favorite holiday color combination is silver, blue and white!!! I love it! I love soft blues and purples paired with silver for a frosty, wintery look! Traditional for me – green, red and gold although I am also a fan of simple red and silver. What a great release! My favorite holiday color combination is teal, red, white and silver. Favorite color combo is silver and blues. Icy and cool, reminds me of my childhood winters in NY. I live in a Southern California and we do not get snow. My favorite color combo for Christmas is pink and silver. White, blue and silver as an accent. The last couple of years, I have loved red and teal blue for a Christmas color combination. I also love red and white. My all-time fave color combo (especially for the holidays=Christmas) is the deep red of a good wine with the muted green of a juicy olive. I think it shows that I live in Greece! lol Of course every other classic color combo is awesome! For me balance is the keyword! I think poppy red, aqua mist and a chocolate brown are nice warm & fuzzy holiday colors. My favorite Christms color combination is red, green, and silver. Stemming from my childhood when we would only decorate our tree with blue and silver ornaments, I am partial to a color combo of dark green, like a forest green, a bright or metallic blue and silver. I guess I must be an old traditionalist. I love the new pastels that people use at Christmas, but if it isn’t green and red it just doesn’t say Christmas to me. My favorite Christmas color combination is red, green, and kraft. I love the tiffany blue with iridescent white, and a touch of red, so elegant! Ever since I was able yo wrap my own gifts for everyone I’ve leaned towards blue & green decor. I love all shades of these two colors. Though I have yo admit, old fashion red and white with green is still awesome. Love this whole holiday release. This year I’m going with turquoise, red and silver. My favorite is light blue, lavender, silver, and white. Reminds me of snow! I love snow! Favorite color combo: The gingerbread colors of Pure Poppy & Dark Chocolate! I’m traditional. Love red, green and gold for Christmas! I grew up in the village that Norman Rockwell lived in and treasure the old fashioned New England Christmas. I love the combination of a deep, dark purple with silver. I love working with teal and pink! Congrats on an awesome release! For Christmas I love red and white, with some touches of silver and dark green. Dark blue and silver for a classic look and aqua and red for a modern feel. My favorite Christmas color combination has the traditional colors of red, green, blue, gold and silver. I do have one little tree that I set up with special collectible ornaments and it has silver, white and light blue ornaments. My favorite Christmas color combo is blue, white & silver. Red, green, white, and brown! Thanks for another fabulous release with TONS of inspiration! I love so many of the different color combinations but seem to go towards blues and silver with snowflakes! Ive been stamping for over 23 years and I got tired of using the same color combinations year after year so now I challenge myself to find something completely new and a combination I usually wouldn’t use! It’s been fun! I love Ocean Tides and Pure Poppy together for Christmas. If I’m going non traditional, I’ve used New Leaf and Pink! My favorite color combination is traditional red and green. I dress it up with gold and make it rustic with kraft. My favorite holiday color combo are the fall colors. I just love the vibrant oranges, red, yellows, greens and browns of fall! I really love red, green, and gold for Christmas. I never get tired of that combination. But I also love red, white, and blue for Fourth of July and summertime. It is so hard to nail down a favorite color combo. I believe if you have the right elements and design, you can make any color combo work for Christmas. And I have seen this done so many times on the PTI blog. Since I love color so much, that is my answer….ANY COLORS! I love the non-traditional colors…. love the aqua/teal and pink/red combo! Those beautiful blues are great too! My favorite combination colors is Red, green, white, gold. Thats christmas for me!!! My favorite holiday color combination is cream, woodgrain, red, green, gold, and silver. The more sparkle the better. My favorite holiday color combination (and I am working on Christmas cards right now) is aqua, red, white and a touch of metallic (silver, pearlized light gold). For Christmas it is Blue and White! I live the traditional red, green and gold. But I also love the red, turquoise, white and silver too!! I just love Christmas!!! ? I like to mix it up, but I really love pure poppy, limeade ice, simply chartreuse and gold. Still liking aqua and red, but this year with an addition of silver! I love the blues, I live in the north and can use for winter and the ocean! Hands down, my favorite is quite classic. My go to holiday colors are reds and greens mixed with white, ivory or kraft colors. I love the combination of red, green, and gold together for Christmas. Thank you for the chance to win. Even though I love and appreciate holiday art done in all colours I would have to say that my favourite lies in the traditional combination of burgandy, deep green and gold. Lately, I’ve been a fan of aqua mist, blush and white. I think my absolute favourite is gold and white but I like to change things up a bit so the colour scheme changes each year. Thanks so much for a chance to win. Cheers. My favourite colour combination is blue-white-silver 🙂 Love the new release! Thank you so much for keeping us inspired! What a fantastic holiday release. Great samples ladies. We’ve been using blue, white and silver for years now to decorate the house. But I also like the traditional red, green, gold colors. Especially for greeting cards. I love blue and gold and cream. 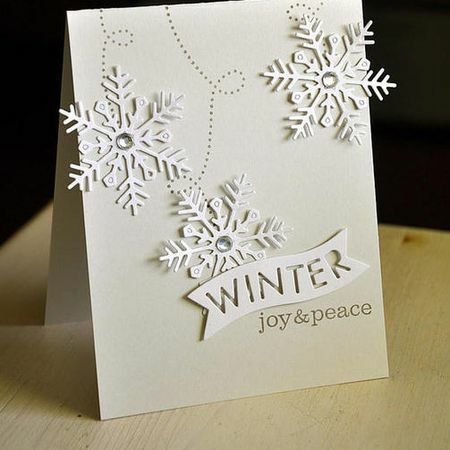 I know they aren’t traditional holiday colors but love them for snowy Christmas cards. I love pink/coral, tan and white for Christmas:)!! MY favorite holiday color combo is varying shades of blue with silver. or burgundy and cream, maybe with a touch of olive green. I love the traditional colors, red, green, gold and white twinkling lights. I am always intrigued by the non-traditional color schemes but I always go back to red and green. Can’t say I prefer one specific holiday color combination over another (LOVE all color, in general) … but I have always particularly enjoyed the unexpected variations. I made a Christmas card last night with a rich raspberry and lime green. Just loved the modern feel of it! My favorite Christmas combination is light blue, silver and white. My favorite color combination for Christmas is red and green with a bit of gold. I love to use blue and silver or maroon and gold. My favorite Christmas colors have to be the darker version of the classics. I love a cranberry/burgundy red with forest green and of course some glitz in the form of gold or silver (not both) and some snow. My favorite holiday color combination is the mixing of shades of green…and cranberry as the bright element. My favorite Christmas colors are a soft blue, champagne, brown and pewter. It makes for a lovely holiday combination. I like different color combinations for different recipients…traditional colors for my ‘older’ recipients, tropical teal, raspberry fizz, simply chartreuse for my ‘younger’ recipients. I also like to add just a touch of metallic to my cards. I love the pretty, soothing combination of Aqua Mist with Pure Poppy, sometimes a little gold embellishment. Blues and silver are my favs. I love red and green and all their variations. Add a little gold and it’s Christmas! I have used many combinations of colors and tend to mix it up, but my go-to colors have to be Simply Chartreuse and Poppy Red on stark white. Sometimes I’ll throw in a dash of Limeade Ice but yeah, red and green for me! My favorite color combo is shades Raspberry Fizz to Hibiscus Burst to Autumn Rose to Scarlet Jewel with gold trimming. So pretty this time of the year. I love the traditional red & green, but also like some of the more modern combos that bring in some blues. I’m a classic girl – red, gold and cream with a little green tossed in is my favorite Christmas colour combination. I love the traditional colors. My favorite Holiday color combination is red, green and gold. My favorite Christmas colors combination is more classic with red, green, silver and gold. You just can’t beat those beautiful classic colors together. I guess I don’t really have a favorite holiday card color combo. However, becuase I gravitate to traditional, I’ve done more red and green (in many shades thereof) than anything. I DO love the pinks and greens too – it just seems like I am usually drawn to some stamp set that won’t work with those colors. This release is awesome and need to get my set selected STAT! You have given me so many things to think about!! I usually use red with gold and maybe some handmade items also. My favorite holiday colors are blue and white.i sparkle it up with a touch of silver. Turquoise, silver, and white – just exquisite!! Right now my favorites for Christmas are looking to be WHITE, Raspberry, Sky Blue and Silver! YUM~! I go to Christmas market in January and love seeing the color trends that come out each year. Chocolate brown with aqua was so beautiful! But I tend to stick with shades of red and green with lots of glitter and sparkle! I don’t have a particular favorite color scheme per se. Unless you count glitter as a color scheme. I love my holiday projects to be sparkly! I think the Aqua Mist color pallet is the one I like the best. Of course, it’s more winter and Christmas based, but that’s the season I like the best. I love teal and raspberry fizz together at christmas! And don’t forget the sparkle! My Favorite Holiday Color Combo is a deep Burgundy/Wine color and Gold. I like combining traditional holiday colors with non-traditional colors. My favorite is blue and red. My favorite winter combo is white with metallics. I’m a traditional color girl…with some gold or silver for accent. White and gold for simple elegance. One of my favorite color combos for Christmas is light blue, white and silver. My favorite holiday combo is red, hot pink, turquoise and white for some freshness. Great release this month. I love shades of blue and green with silver metallic embellishments. I love the traditional red/green/white but I’m also a big fan of non-traditional combos, with my favourite being scarlet jewel/autumn rose/aqua mist with soft stone/silver or fine linen/gold. My favorite used to be white, silver and blue. However now that I have 5 little ones a more colorful pallet is growing on me. Jewel toned blues and gold … love it! Blue and silver, with some white. My favorite xmas holiday combination is kraft and white- though I do love a bit of sparkle included somewhere! I’m such a traditionalist, I love Christmas red, green and white. I will always love the traditional red, green gold and silver, but I have found myself leaning more towards a beautiful soft blue and silver the last couple of years. My real favorite holiday is Thanksgiving. So I love the orange brown red and gold combos….. If it is Christmas? Red and Green of course! My favorite combo would be red and gold. My favorite traditional combo is New Leaf and Pure Poppy and white. Something so crisp and clean about that combo. This year, though, I am really loving Smokey Shadow and Pure Poppy with touches of Soft Stone. Love shades of blue and silver! Hmm, this is a tough one, but I think my favorite would be silver and any shade of blue. Light blue and silver metallic. My favorite color combination for the holidays is Blue, white and silver. A little pink thrown in is very nice, too. Aqua mist and cream and Spring Moss. I like teal shades and silver for Christmas, maybe with a little pink mixed in. Thanks for the fun week of inspiration! Great job, again, to the DT. Can’t wait to have some fun new supplies in my stash. My favorite holiday color combination is red, white and a soft turquoise blue. In my family we argue about whether blue is a Christmas color, but I definitely think it can be. I DEFINITELY love the reds, creams and golds during the holiday season. There is a richness in that particular color combination that really catches my eye, year after year! While I do love the traditional colors of Christmas, my favorite color combination is pink and aqua. I just love those two for Christmas! I did my whole tree in those colors one year! I love aqua and red. I also love the traditional colors of red and green. Thanks for an amazing release! For Christmas I like a dark cranberry red and an olive green, maybe with a bit of gold thrown in for some bling. A couple years ago I made some Christmas cards with aqua, kraft and white. They are still my favorite cards to date. I am loving any new colour combo you have shown me, but traditionally liking kraft with deep red and dark green. Thank you all – a truly lovely release, with so much wonderful inspiration. I like the traditional red, green and gold for Christmas but also like using blue tones with silver. I don’t have a favorite but I’m more often apt to use red, green and gold. I’m a traditionalist: red and green it is, with a little white or gold thrown in for contrast. My favorite holiday colour combo lately is aqua, teal, and red. It’s just so cheerful. It’s also close enough to traditional colours that non-crafters don’t usually find it strange. I love aqua mist, cream and silver for Christmas. Many of my Christmas tags have these colors. I’m loving lime green and red for Christmas with touches of gold thrown in there! I wish I could say I am a non-traditionalist, but I cannot! I use Red and Gold. I use LOTS and LOTS of clear lights and I decorate everywhere I can! I LOVE Christmas! I usually lean towards light blues with a touch of red and silver, but I love your color combos! I’m just not very creative in the color matching department. 🙂 great release! I love traditional Christmas colours but I also love any colour with silver – red & silver, purple & silver, teal & silver etc. My absolute favorite combo is light blue, white and silver. My fave holiday color combo would have to be cream, gold, silver, dark green and cranberry. It’s a rich and timeless color palette. I have new favorites of pink, teal, and greens. So ready to order the new songbirds combo. Very cute and versatile. Red and green, without a doubt. It’s Christmas !! I tend to lean towards the really traditional red and green but I have used all kinds of color schemes for Christmas cards. My favorite are the fall colors of Thanksgiving. For Christmas, I love the combination of red, light aqua blue, and white with a little silver, grey or black. I love aqua and red! Thanks for a chance to win! I like bright colors, so the Fourth of July is one of my favorites. I really love plaid with black and red and green. I decorate a lot with black check and black and white gingham and the plaid fits in nicely. Have to admit, red and green are my favorite holiday colors! But I loved the gold accents on many of the projects this month as well. I love combining shades of blue, silver, and white for Christmas or Chanukah. I love blue and silver together. This year, I’m going with a lot of red and gold. Time to get those Christmas cards made!!! Silver and blue are my favorites! but traditional colors are always welcome. I normally go with Red and Green. This year I think it will be Aqua and Silver. My favorite Christmas color combination is ivory and gold;) So elegant! I love the combo of bright green (limeade ice), green (new leaf), bright pink (raspberry fizz), red (pure poppy) and aqua (Hawaiian shores) with a touch of silver! My favorite holiday color combo is for Halloween…black, purple, orange and a bit of teal. Great release!! I’m pretty traditional, so my fav color combo for Christmas is red and green, but I do also love blues and purples together for a different twist. What an awesome release! I love having the crystals as in snowflakes with white and red. But I have pops of color from the ornaments and Christmas decor from all the previous years that my children and grandchildren have made. They are precious and will always be apart of my holidays. Royal Velvet, Winter Wisteria and Silver Filigree Detail Embossing Powder. To crafting!! My favorite color combination is the traditional red and green from my childhood! I like to sprinkle my projects with small amounts of white and gold also. Still old fashioned red and green, but in the darker tones. And have to mix in some silver along the way! Great stuff. My favorite holiday color combo is red, white, and blue followed by classic red and green. Really I love them all. I’m a traditionalist. I like red and green for Christmas. Throw in some white for snow or add it to red for candy canes. I love the combination of blue, silver, and white. I really dig a combination of lime green, bright pink, turquoise, and silver around the holidays! For holiday/Christmas cards I tend to do a combination of blues or red and green. I like to do more “season’s greetings” and wintery type cards so I gravitate to shades of blue with white and silver as accents. Shimmery blue cardstock is awesome for this! What an amazing release – can’t wait til tonight. My Fav color combos for xmas are Ivory, golds, burgundy and evergreen! This release has really gotten me in the spirit! My favourite holiday colour combo has to be silver and icy blue…so pretty! My favorite Christmas color combo is pink, white and silver with lots of sparkle, sequins and a little vellum thrown in for a soft, cozy feel. my favorite Christmas color combination is kraft, red, sky blue and white. With some shimmer and glitter of course!! My favorite color combination for Christmas is red, green, and turquoise blue with a touch of silver. I love pink and silver or gold for Christmas colors. But I also like real red and turquoise, also. Of Course Fresh Snow, Pure Poppy and New Leaf or Simply Chartreuse with some Hibiscus Burst and some Aqua Mist or Hawaiian Shores thrown in for fun. I also like a little Sweet Blush or Raspberry Fizz on the side depending if I’m going for a softer, or a bold and bright palette. Love lots of color combos…but this year is going to be silver and blue! Definitely teal and orange! I love those two colors that represent fall, Halloween, and just good “poppin” color fun! I love red & white candy cane stripes! I love the rich burgundy, silver, cream, , and chartreuse. I love the traditional red, green and gold for Christmas. Either gold and white or traditional red and green. My favorite color combination is deep blue and white. I love the sparkly old school vintage pinks, blues, and silvers for Christmas. The old vintage Christmas cards and signs are my absolute favorite!! Probably my favorite holiday combination would have to be the traditional dark jewel reds, greens and gold. I’ve never found a color that I don’t use. Many of my cards include pale aqua with yellow or silver. I’m pretty traditional. My usual color combo for Christmas is shades of red and green, with pops of gold. Although all these alternate color combos are looking pretty amazing! For Christmas, red and green. Although I did use blue and silver for a winter combo and really liked it. I love any combo of green and red all the way to Simply Chartreuse and Sweet Blush. My favorite color combination for the season is blue and white! This year I’m really fond of the bright untraditional colors, like teal, raspberry, chartreuse, and red. And of course you got to have some gold! I love burgundy and cream or gold embossed. I have absolutely loved everything from this release. I must say that my favorite Christmas colors are the traditional red and green, but I do like pink and aqua too. I like tone on tone. Blue and green are my current favorites. When I begging a stamping project I always pull out your color charts. Thank you for these! I love the color combination of blue, white and silver for the Christmas holiday! My favorites change all the time, but right now I am drawn to deep blues with white and silver. Night sky and falling snow….magical! Im a classic sort of girl… i love bright red green and glittery white for christmas! I am actually very traditional for Hanukkah. There’s gotta be blue in there somewhere. Silver or gold accents are good too. Of late my favorite Christmas color combination is Kraft, Red, Brown and Silver. My favorite Christmas color combo is the traditional vibrant red and green with gold accents. I really like some of the more contemporary combos of pinks, aquas, purples, chartreuse or other bright greens and silver accents. Thanks for such a beautiful new release. My very favorite holiday color combo is light teal,cream and silver.Gorgeous for Christmas cards!! Gorgeous projects!!! Love!!! I am all about the white, blue and silver. Of course I love colors so vintage colored Christmas ornaments I love too! I love the traditional red, green, and gold for Christmas. It always makes me get into the Christmas spirit! I like the traditional red and green and gold. I also like red and creme together. I must say I am a traditionalist. I love red and green with gold accents. I do! The colors that scream Holiday season to me are the tradional red, white and green. Although my tree has been decorated wit blue and gold for many years; blue being my most favorite color in the whole world! I love the mint green with pink for Christmas, its so modern! I like more vintage colors, instead of bright red and green I prefer olive and more of a burnt red, along with cream and Kraft. My favorite combination is purple and greens. My favorite holiday color combination is red and white, mixture of bright and pureness! Gold, green and red…classic! And really, can you ever have too much gold in your life? I love the way silver pairs with different shades of blue. I like red and gold (if I have to choose just one). But, I’ll also say that I like LOTS of different colors on my Christmas Tree! I love Aqua, Pink and Red with something shiny in silver!!! I cannot do that all over as I do have three men in my family so I do traditional colors in some rooms. I also love winter white!!!! There is nothing wrong with traditional red and green but I am loving the modern combo of fuschia, turquoise, purple and lime green. seriously, the depends on the day. Right now my fav is red and aqua-maybe with some silver for sparkle. 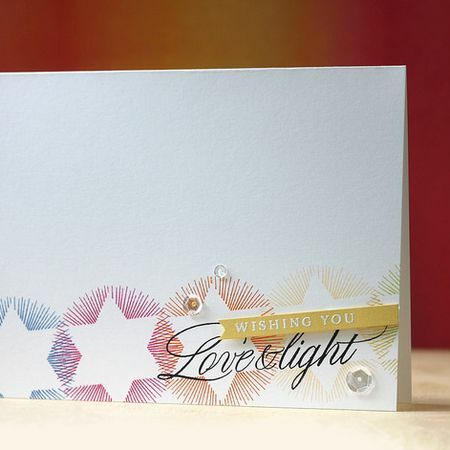 I am really liking the color combo Danielle Flanders used with the red, white, light blue, and silver–gorgeous! Lately I am really like white, aqua mist and pure poppy. My favorite Christmas colors have always been variations on red and green, and recently with metallic or kraft thrown in. However, I do love seeing non-traditional colors, and may even eventually try some! Thanks for the chance to win a great gift certificate – it will really be needed this month! This is a tough question! I vary decor from year to year, but I truly love red, green, and gold, for Christmas. Varying shades of creams, whites, and golds are some of my favorites as well! My favorite Christmas color combination is Cranberry, pine green, teal, and gold. I am traditional, so my favorite color combination is red, green and white. Although I don’t celebrate the holidays, I’ve seen a few displays of turquoise & silver with an added pop of bright pink – it’s stunning! Such beautiful products you make!! My favorite holiday color scheme is actually the red Scottish plaid paired with neutrals. This year I’m using burlap and twine. In other years I’ve used shiny gold or creamy white. So hard to pick a favorite combo – but lately I’ve been doing a lot of shades of aqua & teal with white. So cool and peaceful. But I also love what the DT has been doing with the colors of the gorgeous Painted Poinsettias! Gotta love red and white with a touch of aqua mist. The aqua mist adds a touch of whimsy. Thank you for the inspiration ladies! This has been a great release with so much inspiration! 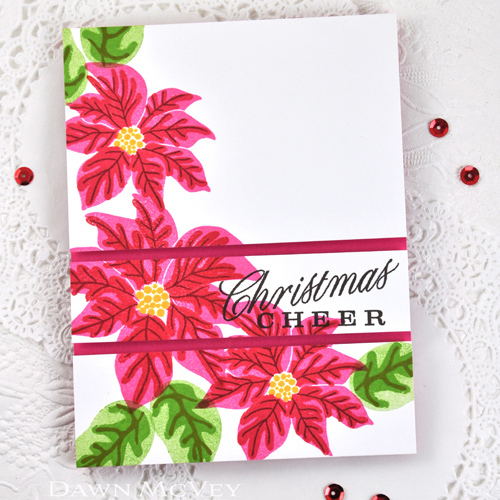 I love to use pink and green for my holiday cards and can’t wait to get started making them! I love the traditional red and green for Christmas! I celebrate Chanuka and other Jewish holidays which have no official, religious color scheme; i’m pretty sure the blue and white/silver scheme was made up by hallmark or some other holiday-related industry. sometimes as a spoof i’ll do a “merry chanukah” theme & use blue, white/silver, red, green & gold. I like most any combination that includes red, and my latest favorite pairings are aqua (either light like Mist or bright like Hawaiian Shores) and kraft. Sometimes I like to mix it up with grey or a cement color like soft stone. My favorite Christmas colors are a cherry cobbler color with kraft, vanilla or white. My favorite colour combo for the Holidays is aqua, red and chartreuse with a touch of gold ans lots of white. thanks! I love blue and silver, sometimes with a tiny touch of red as an accent! My favorite Holiday combo would be Red, Green, Gold & Silver with a hint of blue for Christmas. Pink purple silver and turquoise…prefer it on a glittery white! I definitely tend to lean to the more traditional colors of red & green and I just love Pure Poppy & Limeade Ice together. I love using teal, silver and red for wrapping. But red and green are always classics too. I usually go for the traditional colors red and green–with a splash of gold—but I also like the look of blue and silver!!! I love the traditional red, olive green, craft, and a little touch of gold. It depends on the feel of the project…love silver, white and a hint of blue for a more elegant feel. But for a rustic feel love classic red, green and Kraft. For Christmas I love the country spin of red, craft, cream and a bit of green. I love frost blue, frost purple, sliver, and jewel tones. I love the way the frost colors work so well wih a snowflake theme. I love the little snowman coming out. Lately I have really liked. kraft, red and black. Every few years it changes! My favorite combinations are blues and silver or silver and gold! I love using non-traditional colors for the holiday’s. My favorite is Rasberry Fizz and Agua Mist or Hawaiian Shores. My favorite Christmas combination would be red and gold; but I’m starting to like the pink, blue, & silver combo I’ve been seeing too. Lately I am loving Pinefeather, Scarlet Jewel and Kraft. Sliver and Gold….and then throw in some green and my favorite color red…can’t go wrong. i still like the more traditional colors. Green and red and gold. My favorite Christmas combination is probably blues with silver and white but I also love the traditional red and green. For Halloween it has to be orange and black because you just can’t mess with Halloween tradition. For Christmas I would have to say white and silver. White is pure and clean and silver reminds me of the shining north star. It really depends what I am working with, if it is snow flakes I like blues and sliver. I also like the traditional Red, Green and Gold combo. Your designer’s project do offer more nontraditional colors for me to think outside the box. Great release! My favorite is Halloween colors: orange, green, purple,and black. 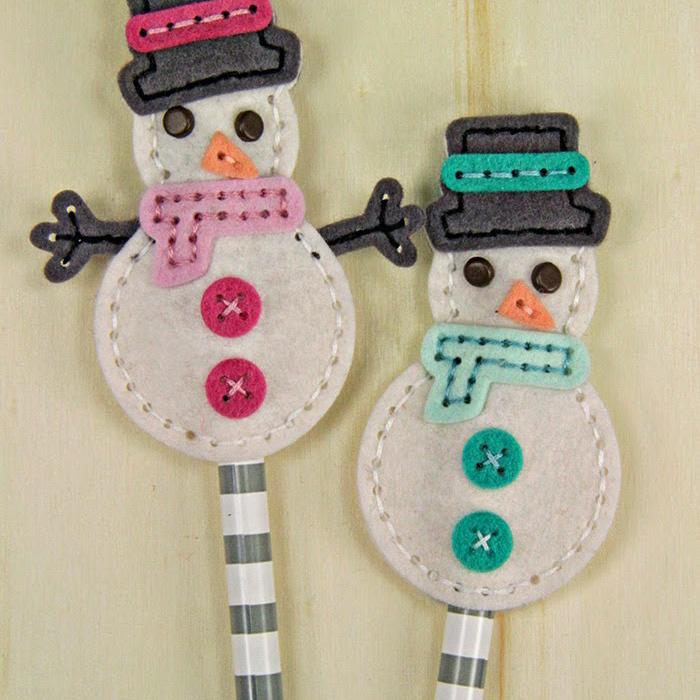 For Christmas I always end up back with craft card stock, white or black as the neutral and a pop of dark green or red. Very traditional but always classy. I always lean toward red and green with a touch of gold – especially for decorating. For my cardmaking, though, I love using some of the non-traditional color combinations. My favorite Christmas color combo would probably be dark red, mauve, and gold. My favorite color combination for Christmas is pale gold,browns, cream, white, and black. Sometimes I would add a pop of color such as pink or teal. I generally prefer the warm, earth tones of autumn but I’m loving the bright, non-traditional colors you’re using for Christmas! My favorites are old style with many different colors. For Chanukah I love blue, white and silver. For Christmas I love a deep red, teal blue and white. For Christmas, I like jewel tones like Scarlet Jewel and Pinefeather with a touch of metallic gold. But I always like to see some of the “odd” colors too like a light blue or purple. Before I would have said traditional red & green, but I love the blues/aqua tones now! I like the traditional red and green for Christmas. I love the non-traditional colors… silver and all shades of turquoise, aqua blue and a hint of anything shimmery! a pop of a very very red. My favorite holiday (christmas) color combo is red and green, with a touch of gold. Different shades of blue with a hint of siver are great, too. The traditional red and green are my favorite. Other Christmas colors are used depending on trends, but Christmas to me will always be red and green! It’s all about aqua, red, kraft, and cream for me! TFS!!! Oh, and a little bit of gold or silver never hurt! For Christmas I always like the traditional colors of red, green, gold and silver. I love red, white and kraft for Christmas! I find that such a lovely combo! I love using the brown paper ‘kraft’ color to make Christmas have a down-to-earth feel. It reminds me of pinecones. White and craft have a soft snowy feel. Thank you for the fun release week! I love the traditional red and green for Christmas but very closely followed by pink, teal and silver. My favorite Christmas color combo is the classic red and white. Silver and gold, with red and green garlands. Anything from nature around Christmas is my perfect color palette. That’s a really tough question. I think my favorite is still the traditional red and green. Love aqua mist paired with pure poppy with some silver thrown in. My favorite holiday color combo is red, pink, and lime green with a touch of aqua! Not an easy question to answer, I love all colors. At Christmas time I would lean more towards using jewel tones. What fun projects above! My favorite Christmas combo is quite traditional. It’s cream with the Olive-type green with a good deep red. I love the combo of classic kraft, scarlet jewel, autumn rose, and tropical teal. Traditional and elegant: red, green, gold, silver with plenty of sparkle! I love red and white. Unfortunately, that sounds so boring, but I just love it. It must be the kid in me – candy canes anyone? The release this month is fabulous. I love all the new stuff , just hope I can stay away until 3am to order ? I LOVE many color combos for Christmas, but tend towards a deeper wine/merlot red, olive green, cream and gold for sparkle. My favorite color combo is the monochromatic blues! Such a fun release this month – everything is adorable as always! Anything blue and silver. It makes me think of the night sky and stars that special night when Christmas truly began. Oh! My most favorite holiday color combinations is Hawaiian Shores, Raspberry Fizz combined with silver…Love it! Red, white, cream, and wood is so pretty. I love scarlet jewel and gold…sooo pretty to me. I usually used different color combo for my Christmas cards every year. This year I might use grey, pink and silver. I have a few favourites, i like the traditional red and green, with a hint of gold. Pale pink and gold. Also pale pink, silver and white. However this year i have my eye on doing silver, gold and white 🙂 loved everything from this release and fab project from all the girls. For card making, anything goes for me as have seen some beautiful combinations I would never have tried…but will now. For decorating, our tree is scarlet jewel, cream and gold ~ very rich looking. I still love jewel tones, but I am playing more with simple colors, such as white and gold, cream and gold, etc. I have loved the Aqua mist & red combo for a few years but this year I think I’m going to do a lot of Aqua mist & gold….love it!! Ooh how I love white and blue, reminds me of when my dear dad used to flock our Christmas tree white and put beautiful blue christmas lights on the tree! Great release! I like chartreuse and crimson red, or light blue with bright red. I have to be boring and traditional, but I love red and green for the Christmas holidays, although silver and gold are a close second. What a great release. Traditional red and green would be first choice. Then dark blue with silver. Fav colors would be the deep rich reds & dark greens but this year I’m using bright apple green as the accent & lots of sparkle! Wonderful release PTI!!! Wow you guys are prolific! I’m pretty much a traditionalist so rich reds and greens are my go to combinations for holiday card making. But I equally love it when the reds and greens are shifted a bit to the pink and line shades. My favorite holiday color combo is navy/silver and red/gold. My fave combo the last few years has been light aqua, light pink, lime green, and red. I love the Gold and cream, but the Blue and silver combinations are a close second!! Well I will have to stick with the traditional red and green for Christmas still my favorite!! I’m a traditionalist, so I love red and green! Red, green, and gold. Super simple but I love that combo! I am really loving the pink and aqua combination. I love the traditional red, green and white for Christmas decorating, and use that in the formal areas of my home. In our more casual spaces, I tend to mix it up, this year I think I will try aqua mist, silver and white. Deep red and silver without glitter! accents,and what a release, I love it all! The traditional Christmas colors are my favorites. Other colors can mix it up or make it interesting, but the reds, greens, silver and gold say Christmas. Holiday colour combo has to be red and gold! 🙂 That sounds like Christmas and New Year! i like red, aqua and green with a touch of ivory and silver! My favorite holiday color combination would be shades of blue and silver – so elegant. I think silver and blue are a striking color combination. Thanks for all the inspiration. I love the Halloween combination of orange, black, purple and lime green. For Christmas, any non-traditional color combo. Pink, black and silver comes to mind. I have two favorites: deep blue with silver and kraft, red,and white. Of course with sparkle and glitter everywhere! Red and white / kraft or Shades of Blue. My favorite Christmas color combo is a deep crimson red (scarlet jewel), a deep green (ripe advocado) and kraft. The combination I think is always elegant is deep, dark blue with silver and snowy white. Love your new releases! I like the traditional Christmas colors – red, green, white, gold and silver. They just touch off that Christmasy feel for me. I love Christmas! My favorite color combination is red and silver. I use it in my décor, When making cards, I still like the reds, burgundy, and greens. I love red and white as a classic/traditional color combo. I think it always just looks clean and crisp but still bright and cheery. If I was going for a non-traditional combo it would probably be aqua or a Hawaiian shores color and a bright pink. For some reason I just love those together! Great release this month (as always)! I love red, white, and kraft for Christmas. I think that it looks awesome for a rustic Christmas decor! I love light blue & silver. I am very traditional, and love deep red, green and gold! My favorite holiday combination is white, turquoise and red for Christmas…love the retro feel. I really like pastels or soft colors; or country colors like cream, navy, hunter, tan and burgundy. I like the traditional red and green. Maybe a bit of gold thrown in. When it comes to Christmas, I’m such a traditionalist. I love red and silver together. Mis colores favoritos para Navidad son los tonos blancos y dorados, pero siempre dejo lugar para los tradicionales rojo, verde y blanco. Right now, my favorite combo is Pure Poppy, Ocean Tides, Spring Moss and Aqua Mist as used in the Rustic Snowflakes paper pad. Oh my…this changes so much based on what it’s for…cards vs. decor vs. gift wrapping etc. (sometimes within the same season). Red is my favorite color so red and white is one, red and pink when I’m feeling “funky”, but I also enjoy navy and silver. My favorite combo is red, green and white. Thanks for the inspiration cards. And thanks for the chance to win. I have to say I love the traditional red and green, with either silver or gold thrown in there! My favorite combination is light purple and light blue. My favorite Christmas card color combination is Royal Velvet (or any shade of Blue really), pure crisp White and sparkly Silver. Thank you for another wonderful release of your beautiful products! My favorite color combo is Aqua Mist, red and cream with a little silver or gold thrown in! But there are so many beautiful projects in this release I might change my mind! My favorite Christmas combo is lime green, dark red and white. I go in spurts, but right now it’s red, kraft, white and black. Christmas is my favorite time of year, so I would have to say Cranberry and Dark Hunter Green are my favorite combinations. Thank you for the opportunity! My go to combination is often the blues and white with silver accents. I also lean toward white on white with just of touch of an accent color. My favorite holiday color combo is the traditional red and green, but I love to use the deeper reds and greens, like scarlet jewel and pinefeather . . . .thanks for an amazing release! I love the fun color combinations. So aqua, bright green, bright pink and white. I just think it is so fresh and fun! It puts a fun spin on the traditional Christmas colors. Lately I’m loving the majesty of gold and white on Christmas cards! Traditional holiday color combinations are what I gravitate toward, but usually with a twist of a change in shades or the addition of another color. I love the traditional vintage red, green, and gold; however, one year I made all new ornaments and did a cream,rosy pink, and gold and it was beautiful too! Oh my goodness, what fabulous projects!!! I especially love the felt snowmen. You totally nailed my favorite color combo: Classic Kraft, Scarlet Jewel, Autumn Rose and Tropical Teal. Love me some silver, gold and mint for Christmas! My living room is decorated with red and green so I naturally love the traditional colors for Christmas too. Decorating for the holidays is just an extension of my everyday look. Besides red and green, I add in touches of gold and white. Teal, red, white and silver absolutely!! My favorite Christmas colors are silver, white and blue. My entire house is decorated heavily in reds and greens, so it’s easy to use those colors during Christmas. 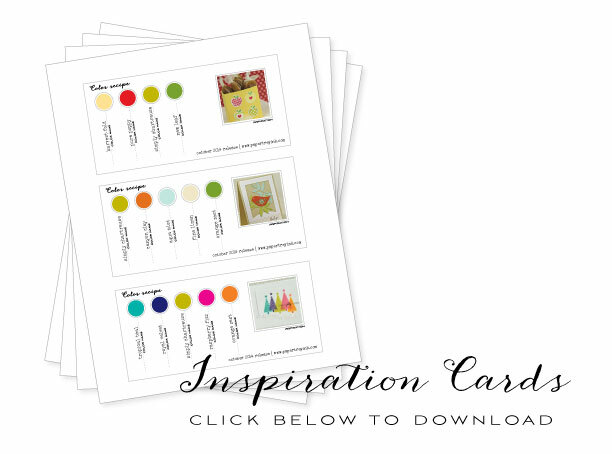 I love so many different combinations, so I use my card making to play with more colors! I’m a pretty traditional green-and-red Christmas kind of gal, but lately I’ve been liking pink and aqua for Christmas, quite a step out of my comfort zone! Call me a traditionalist….Green & Red come first followed by all white! for me, lime green and turquoise with silver accents! My favorite color combination is Purple and Teal. It always catches my eye and makes me smile. i really love aqua mist, pure poppy & vintage cream or white…plus a little light grey…talk about gorgeous! I am really liking the teal, chartreuse, white, and silver combo this year. Also, what a great release, I love the projects you all made. I’m going for shades of Blue/Aqua/Teal with Gold accents for a Holiday color combo this year. I, too, tend to be a traditionalist with a preference for green, red, white, and gold. Although, the red, aqua, and white is becoming one of my favorites as well. I like a deep green with a deep red, with a little bit of blue mixed in for pop! I love a rainbow of colors with colored lights and frosted tips on all the branches of the tree. Gingerbread houses, men, gumdrops, candycanes and colorful balls. Blue, white and silver are my fav colors for Christmas and just about everything else. I like some yellow thrown in there sometimes too, it kind of brightens things up a bit. Hi, my favourite Christmas color combination is red/white with any earthtones added and a little splash of teal and silver for a little punch. While I love traditional color schemes my fav. is the light blue, pink and light green! So fun and bright together! I love the colors of fall–golds, deep reds, browns and then add in a bit of white for the frost. But then I love the pastel shades found at Easter time. My favorite Christmas colors are silver, pink and light blue. My favorite holiday is Thanksgiving, and I love any combination of warm autumn colors. I really like the traditional colors of red, green, silver, and gold. But, I love pink in Christmas too. Also ivory!!!!!! Christmas is my favorite time of year. Although I love traditional colours for the holidays. My favourite combination is aqua, green and pink! Cream/White with Silver or gold. I don’t really have a favorite–I like to do something different each Christmas. This year, my favorite is white, hot pink, and bright green! I like the light blue, navy, maroon and silver. My favorite holiday color combo is teal and silver! I love rich jewel tones with a touch of gold. I prefer non-traditional colors for my Christmas projects. I use Hibiscus Burst and Limeade Ice with a little splash of silver accents. I’m mostly a traditional green and red gal, but I also do love blue and silver! Cranberry (not red), pink and green (with aqua tones) with white and gold and silver for accents. My favourite Christmas combo is blue and white with a splash of red. I am a traditional girl – so my favourite combo for Christmas would be red, green and gold. Blue, silver & white will be the colors of my Christmas cards this year. Love that combination! I am pretty traditional so my favorite Christmas holiday colors are deep cranberry, pine green and gold. But I love all the combinations of your projects. Aqua and red is very fresh to me. I love the traditional red and green, but also really like gold and cream or silver with white for a richer, more elegant look. I have always loved the traditional Christmas colors: sparkling snowy white, deep red, forest green, and glittering silver. However, I really like the bright and happy combination of teal, purple, green, raspberry, and orange used in the projects for this release. The traditional varieties are my absolute favourites, but I do like some modern splashes as a change every now and then. for Easter it´s green, yellow, white and pink, for weddings it´s up to the couple, though I do like the whitish version. Fall holidays are definitely the punpkin and fall foliage shades and Christmas has to be red and green with some silver or gold mixed in. The traditional colors are always my favorite with the green being a deeper, pine green and the red also deeper–but always with some metallic touches too! I love making christmas cards in soft pink with silver! 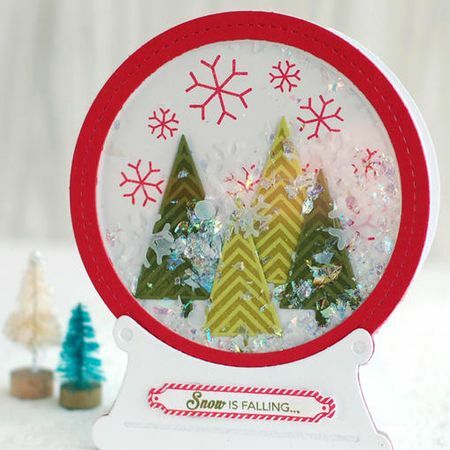 Oh my goodness, such great new holiday products and inspiration! My favorite holiday color combination is silver, white, a nice aqua blue, and touches of red (a little more on the pink rather than orange tone). Although I also love the classic Christmas red, green, and white. There are so many combos I like – pink + silver + cream/white, Pine green + dark brown + red, gold + white/cream, blue + white, kraft + red + green ….. Favorite christmas palette is green and red!! I love to add a little silver and sparkle to what ever color combination I use, but this year I think I’m going to try the aqua mist, enchanted evening, silver and white with maybe some accent in red. I’m a red, green, white traditional kind of gal. I’ve started using different shades of my traditional colors though. I change my favorite color combo every year, so this year it will coincide with the Make it Market kit. Last year’s combo involved blush, poppy, stone, new leaf, smokey shadow. My favorite color combination is purple, teal, white and/or kraft with a splash of silver. I like to experiment, but my husband will often say it doesn’t look very Christmasey. So, to satisfy his traditional mindset, I use a lot of vanilla, dark red, green and sometime blues (I can get away with that). Of course, I sometimes just ignore his color remarks! It changes from year to year. This year it is probably light teal, pink and preppy green. My tastes have changed from the traditional red and green to a more vintage color scheme…the mauves and deeper greens with crèam colors are what I like. I enjoy so many combos but always go back to the traditional red, green and gold as a favourite. It just is Christmas for me. Gold and white would be my favorite holiday color combination. I tend to pick white and metallic gold because it is so elegant but I’m also seeing whimsical cards with light blues and pinks that I like. Great reveal: I have to say the song bird stamp set is my favorite. Last year I did a Coastal Christmas so aqua, silver, sea glass are really my favorites! I love blue and gold together for the holidays – wintery and stunning! My favorite holiday combo is bright red, white and gold/silver…The colors just pop and cards look so festive. I love the classic red, green and white with a dash of silver or gold. For Halloween I like orange and purple with a touch of black. I would love to win this for my wife who is a PTI fanatic. She likes to decorate our house for Christmas in gold and red. Silver, light blue and white are my favorite Christmas colors, but I also like the traditional red and green. My favorite color combo is Aqua mist with anything! My favorite holiday color combo is red & aqua!! My favorite holiday color combo is the orange,brown and green-I love creating in this palette not only for Thanksgiving. For Christmas I like to go not very traditional way-blue, purple and silver/white. Traditional Christmas colors of red, white, and a hint of green are my favorite. I love the traditional Scandinavian colours of bright warm red, deep or smoky blue, and white at Christmas. Have to say how much I love this month’s releases, especially the ones which extend into other hobbies like canning and stitching! The past few years I’ve been using a lot of blue, white, and silver on all my Christmas cards. Love that combination! I love the classic cream, rich red and warm green! I love to have fun with lots of other colors though. Fabulous release! Thanks for all the inspiration!! We tend to do different color combos every year and each year its my favorite! I’m always drawn to anything pink though! But I also love the natural kraft/white/country feel! I guess I’m all over the place! I made a card last year with raspberry fizz, new leaf & silver & I think those are the colors I’m always drawn to! Love craft, red and white but also traditional green & red but also red, white & silver and glitter! Definitely Blues with Silver. I love the look of cool sparkle! Jewel tones are always on the top of my list! My colors for the winter season are shades of blues with silver and shimmery white. Reminds me of a sunny day just after a fresh snowfall! Shimmery white snow and gorgeous blue skies. Brrrrrr. Great release and my favorite colors are the warm colors copper, dark red and cream. Right now I am loving aqua and silver! I love Aqua Mist with Raspberry Fizz for Christmas cards – so fresh and most important – FUN! I like red, lime green, and silver or gold. Also love red and white, gold and white, and blue and silver. The traditional red & green will always be my favorite. They just scream Christmas to me. Used to adhere to traditional red/green or burgundy/green color schemes but now I am non-denominational and embrace all. Kinda Dr Suess-ish. I am a traditionalist when it comes to holiday colors. I like red/green/silver/gold for Christmas. Great question – I love blue & silver for my holiday crafting, two of my favorite colors all year round. I love aqua blue, lime green and white with a little touch of dark red in there somewhere! My favorite Christmas color combination is jewel toned red & green with a little metallic gold somewhere. I love traditional colors, green, red, black, white or cream and gold. Over the years, Dawn has made so many gorgeous projects and tags with these colors. She keeps these colors at the top of my list. The one year I decorated in gold and silver I liked it but missed my red and green so now use all of it. My favorite colors are those of Thanksgiving: the traditional oranges or rust, yellow/golds, greens, browns. I am drawn to red, black and white this year. Love the release this month! My favorites are red, white and silver. I always assume the color green is covered with the tree and other greenery so I’m always looking for something to pop with it. My favorite color combination for Christmas are white, off white, kraft, and touches of green. I love to use Tropical Teal and Raspberry Fizz because they are not traditional colors. They are bright, joyful and remind me of the warmer weather where I live. Another wonderful release! My favorite color combination for the last couple of years has been Aqua Mist, Pure Poppy and Simply Chartreuse with Fresh Snow, True Black and/or Smokey Shadow. Scalet Jewl, autumn rose and ripe avacado! This year the colors that caught my eyes have been the pinks, oranges, with teal and blues. Perhaps because Southern California is so warm still, I don’t feel the snowy white and chilly blues yet. Kraft, red, white, and gold. Can’t wait to start on my holiday projects! My fav Halloween colour combo is green, purple, orange & black!! I like classic red, green and white with a touch of gold! Just love a robin’s egg blue, red, silver and white combo but then I love all things robin’s egg blue! Anymore, I don’t think there’s a Christmas color combination that I don’t love, but I am the giddiest about the new combination of turquoise, aqua, poppy red and bright pink. I absolutely love it and cannot resist anything Holiday related in this color scheme! Love this release, too! My favorite Christmas color combination is red, bright green, white and silver. Love the non-traditional colors….pinks, blues, and silver. Great release! My favorite color is white and silver. I am a traditionalist. I like red and green but I have also started adding white into the mix. I’m so traditional when it comes to Christmas, so I have to say red and green is my fave combo!! White and gold is my favorite color combination for holiday. BUT I have grown very fond of Scarlet Jewel, Ivory, and Kraft (thank you, Heather!) and Raspberry Fizz, Limeade Ice, and Hawaiian Shores (ala Dawn McVey!). My new favorite combo. is red, lime green, pink, turquoise, and a touch of silver. My favorite holiday color combo is Red, Gold and Pink with white or cream. I love good ole red and green but with a bit of vintage cream and black thrown in for good measure! I don’t really have a favourite colour combination, but do favour non-traditional. But if pushed to make a choice probably red and grey, so classic and elegant. I love white/cream & gold. It’s so elegant and peaceful. I have tried different themes over the years but I love red and gold on my tree, especially as it tones beautifully with the room colours. I love bright red, lime green, white and green! A little twist on the traditional color combo! I don’t think I have a favorite christmas color combination, because it seems to change each year. I like the ones with the tropical twists of teal, lime green, a the bright pinks usually because although I live in the northern hemisphere its in the south part and it really doesn’t get cold here, so the tropical colors just seem more at home, that and cute little woodland and or arctic animals. If we are talking about Christmas, my favorite color combination is the traditional red & green, with either some silver or gold thrown in for added sparkle. My favourite holiday colour combo is the traditional red and green. Thank you for the chance to win! For holiday color combinations I like to use the non-traditional colors. Looking for a fun combo for this year’s cards. Favorite holiday colors are red and gold! Its so festive and merry! It’s always been a dark red and pine green for Christmas but I saw some really pretty Christmas cards by the design team using Pure Poppy, Tropical Teal, Hawaiian Shores and Aqua Mist. I absolutely love the new, trendy non-traditional combo of bright pink, grey/silver and white! My go to Christmas colors are pink and turquoise with a touch of gold. My favorite Christmas color combination is red, green & gold. I do like to add different shades of reds & greens each year to mix it up for a different look. My favorite color combination is blue and silver or shimmery white. My second (which is very close to the first!) is white and gold. It must be the garland we decorated with growing up! Well I might be am old fuddy duddy but Christmas red & green always makes me smile! I love teal blue, red, white and craft colored items for Christmas. When I think of Christmas colors, I think of blue and silver and white. Green, red and silver also are nice. I’m a traditional kind of crafter…red/green are my favorite Christmas colors, but I am also really fond of navy and silver for holiday cards. Great release! Love shimmering white and silver and red. Very elegant. My favorite combination is light pink and green. Even our outdoor house lights are pink. Gotta go with the blue and silver giving the silver some shimmer or glitter. Silver, blue, and white. My favorites. I love the making the Christmas balls with the new Christmas kit. It is just so quick and easy! I can’t go past the colour combination of red, ice blue, white and silver – so many possibilities to dress it up! I love white and a mix of metallic, silver, gold, copper and bronze. They all look great with Kraft and/or burlap. I love to combine pale greens, aqua and blues… sometimes with a dash of violet! Love the red and light blue combo in place of red and green for Christmas. I like my Christmas colors to be traditional. Deep red, pine green, and gold. I am a traditionalist and love red, green and silver. But I also love pink and line green. I love the bright greens, reds, and white of Christmas. But Hobby Lobby has a way of making you want the pretty pinks, purples and turquoises with all the decorations. My absolute favorite color combination for the holiday is Ripe Avocado, Scarlet Jewel, Kraft and Rustic Cream. I still like red and green, BUT not the traditional shades of red and green………a lime-green and a “dulled-down” red are nice. Red and silver or red and aqua are my favorites for Christmas! I am traditional and love the reds and greens, but golds and silver comes a close second. Seeing all the different colors on the different projects is making me have second thoughts. My favorite color combination for Christmas is pink and turquoise, I can add also a little lavender and yellow , but mostly the first two colors. For men I go with neutrals and a splash of vivid color be it hawaiian shores or a nice PTI green,or red that always works with neutrals specially soft grey or brown. Thanks for the opportunity to win! Counting the hours to open my wallet once again! For Christmas my favourite is kraft, white and red….that reminds me, better start making some Christmas cards! I love the traditional red and green with a touch of gold. Wow, this is actually a tough question because it depends on the holiday. I love Valentine’s Day because the red and pink is so welcome when you’ve had nonstop snow and whiteness outside (or gray!). Love the Fall colors associated with Halloween and Thanksgiving of russet, orange, red, golden yellow and muted green. Christmas I like a splash of purple amidst the reds and greens. Lots of colors! My favorite Christmas color combination is Red & Kraft. Each Christmas I do try different colour combinations, but in the end always return to my old favourites of red white and green with hints of gold! classic. I’m an omnivore when it comes to colours and my favourites keep changing, but whether I go for traditional or non-traditional combinations, I try to keep the palette quite limited. It’s usually white, kraft or some light shade with one or two other colours. You also can’t go wrong with silver or gold. I would have to say the traditional red and green. There are other color combinations that look great, but they come and go. Red and green is timeless. My favorite color combinations for Christmas are red, green and gold. I usually stick to the tradition red, green and white. Love anything with the red and white candy cane look. Thanks for the chance to win! That’s a hard one – every year it changes. This year it’s red and white. Last year it was pink. Silver, light blue and white for Christmas. My favorite colors are kraft, brown and red. I love to play with lots of different colour combinations but a long standing favourite is red, pale blue and white maybe with a touch of kraft. Has a lovely crsip feel! My favorite right now is dark blue, silver and white. I still like the traditional colors, of course but I am willing to give other combos a try. Gold, copper and orange, not traditional BUT gorgeous together! Oh my – right now, this minute, heehee my favorite colour combo is teal, red, and pink – so perfect! I am a traditionalist. I love red, green and gold. I think my favorite holiday color combination would be blue and silver – it just looks so peaceful and classy. My favorite color combo for Christmas cards is teal, green, red and silver. Thanks for the chance! I love blue and silver together for Christmas.